It has taken me almost 2 months to realise something that certain other people would have noticed immediately. The shops here seem to be in clusters . By that, I mean a particular street will just have computer related shops or health related shops, for instance. 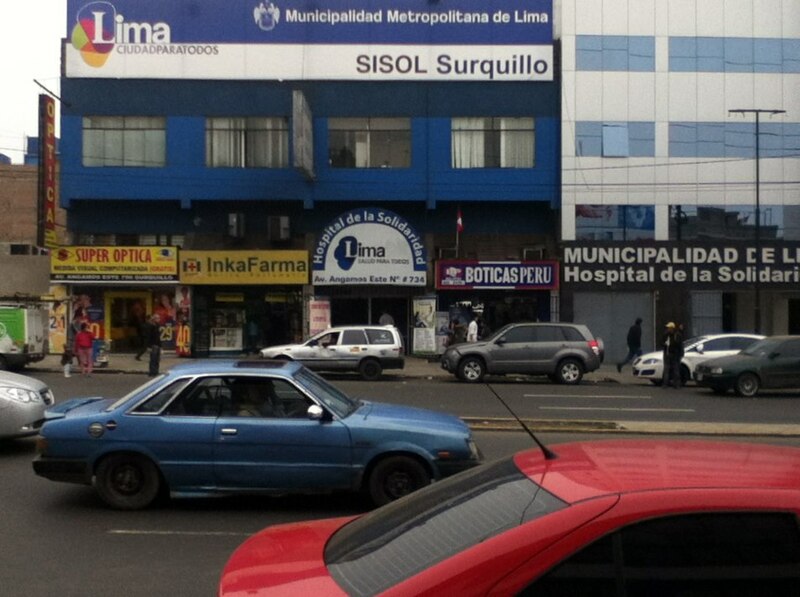 A large part of this particular street in Surquillo, Lima, is dedicated to hospitals, dentists, pharmacies and opticians etc. Anything health related. Then it changes to car spares and similar things. As I recalled having walked along a street with shops catering only to people requiring protective clothing for the construction industry, the light finally came on in my head. There must be a street with shoes, socks, all manner of clothing and maybe in my size. 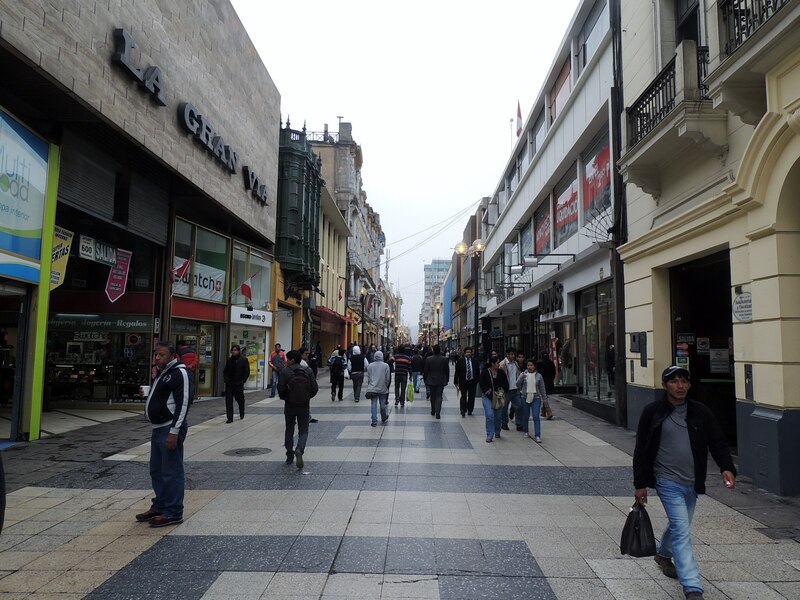 The main street for shopping in central Lima, turned out to be the Jirón de la Unión, which is pedestrianised, with traffic crossing in places. It was where I bought my working boots but I thought I would return in daylight and take a closer look and also do some sight seeing as this street of shops leads directly to the Plaza Mayor. I managed to find a pair of all terrain shoes, quite quickly and at a good price. There are quite a lot of street vendors and I soon found myself in negotiations for a useful map of Perú. The seller wanted 25 soles, which is about £6.50. I offered 5 soles and we haggled for ages. I was enjoying it because he was from Cusco and his accent was easier for me to understand than that of the local population. I abandoned the usual principle of haggling and stuck to my original offer and eventually he agreed. I did feel a bit mean but happy mean. I went on to the Plaza Mayor,took a few pictures and then spent the 20 soles I saved earlier taking a tour of the Archbishop’s Palace. I have no intention of using this blog as a platform for religious views (for or against) but I was amazed to see the level of luxury that the Archbishop and his cronies lived in, while their impoverished congregation no doubt starved and/or werehomeless. 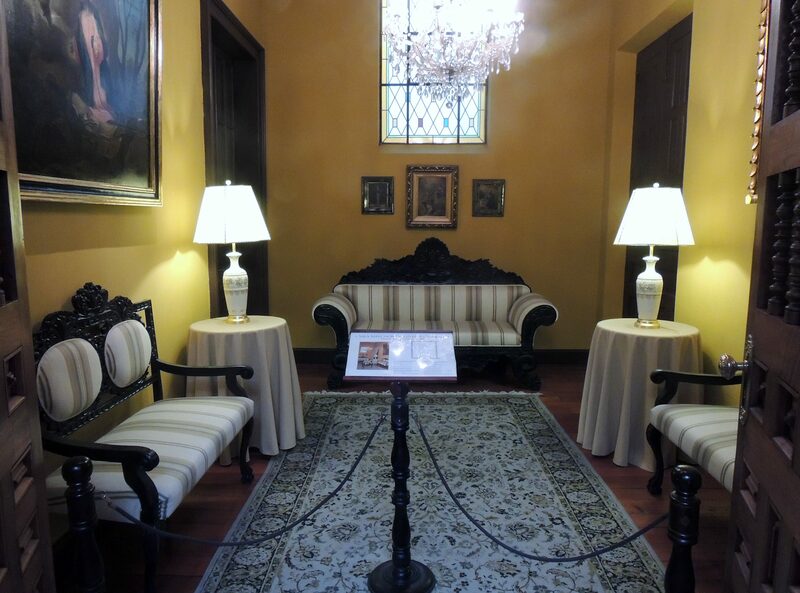 The tour did not take long and I soon found myself exchanging the cloisters in the palace for those in an adjoining street where there was a cluster of restaurants. I settled for Peru Gourmet, which in spite of its name was very reasonably priced. 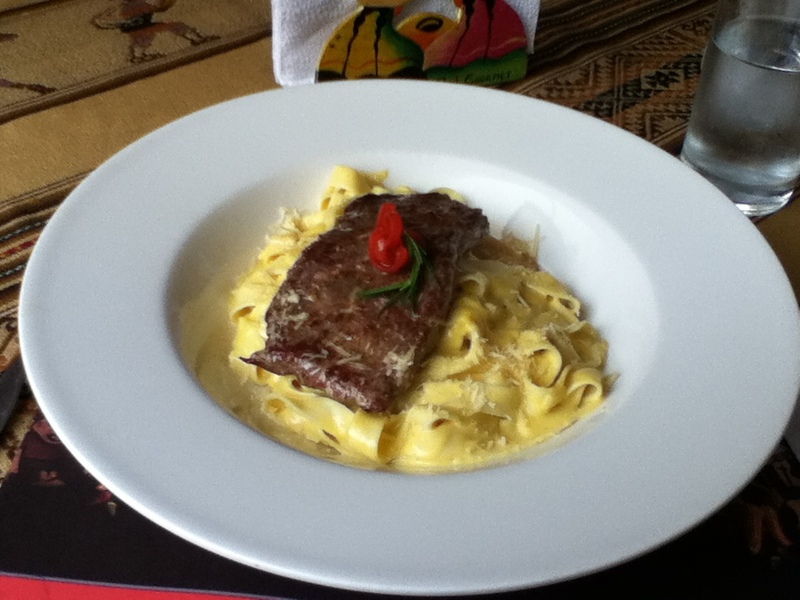 My lunch consisting of Argentinian beef with fettuccine and a creamy sauce. Naughty but nice!! Accompanied by water and followed by a nice strong cup of coffee. 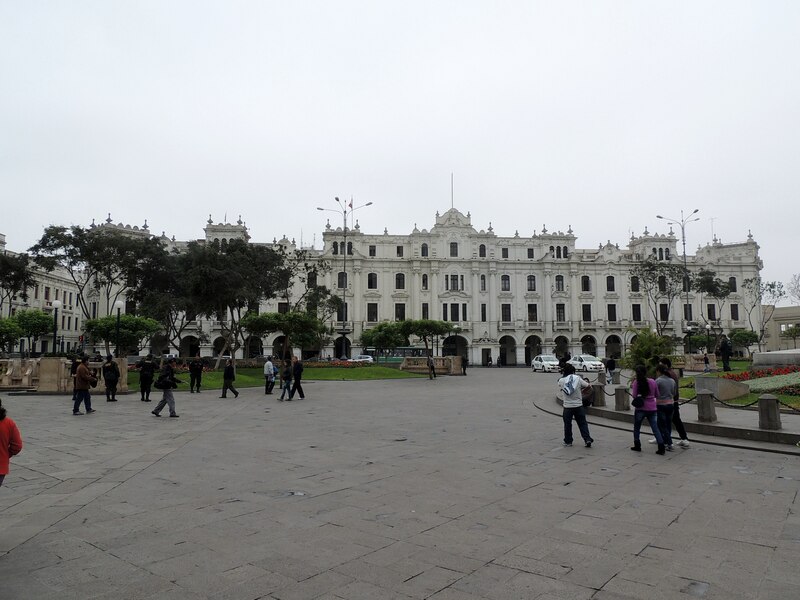 I made my way back to the bus station via the Plaza de San Martin feeling reasonably contented, although I am a bit worried about my physical fitness after being laid up for almost 2 weeks. 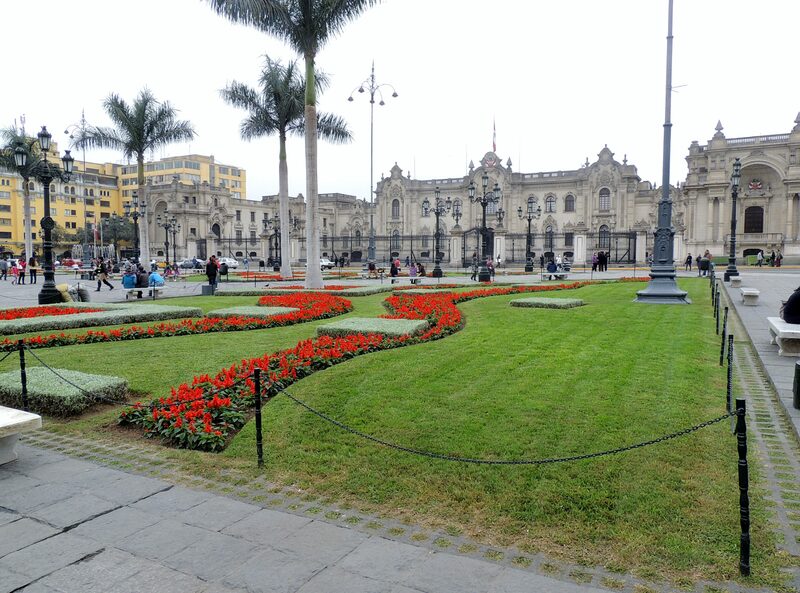 This entry was posted in Recent Activity and tagged Archbishop, Cusco, Jirón de la Unión, Lima, Palace, Peru, Plaza Mayor, South America, Surquillo. Bookmark the permalink. i didn’t know you loved shopping! Correct!! I don’t like shopping but have had problems locating some essential items. Good idea to walk yourself fit!